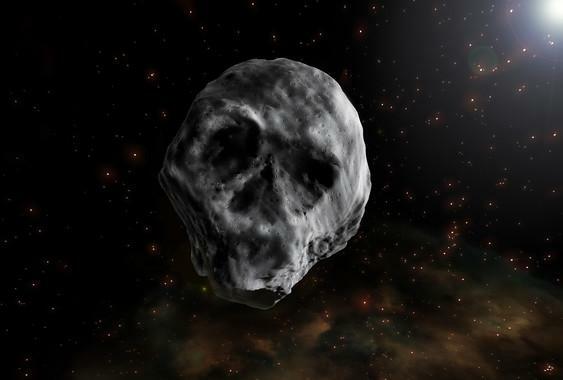 If that wasn’t bad enough, astronomers have discovered that one of these potential doomsday harbingers looks eerily like a skull. This isn’t our first encounter with the 2,000 foot across TB145, it passed by us on Halloween 2015 at a distance of about 300,000 miles. 300,000 miles may sound like not that close, but that’s about the average distance the moon orbits the Earth. “We found that the object reflects about six percent of the light it receives from the sun,”; said Vishnu Reddy, a research scientist at the Planetary Science Institute, Tucson, Arizona. That is similar to fresh asphalt, and while here on Earth we think that is pretty dark, it is brighter than a typical comet which reflects only 3 to 5 percent of the light. “That suggests it could be cometary in origin –- but as there is no coma evident, the conclusion is it is a dead comet.” said Reddy. But rest easy as TB145 will stay a safe 24 million miles away this coming fall, which is about one quarter the distance between the Earth and the Sun.